Exploring mankind’s compulsion to go to battle, Jim Neel (AL) created Babel during his 2008 residency in the Arts Center’s Arts/Industry program at Kohler Co. 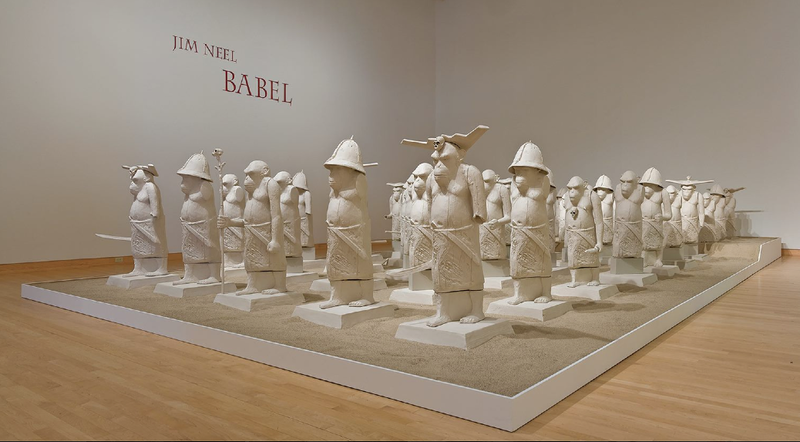 Consisting of 50 life-size, slipcast chimpanzees dressed in armor and standing in formation, Babel recalls military conflicts throughout history and the resulting devastation. Neel’s stalwart army emerges from the sand as if discovered during an archeological excavation, conjuring a ghostly military force. Accompanying the chimp formation are 50 voices reading a sonnet by Percy Bysshe Shelley (1792-1822). Each reader begins the poem at a different point; the resultant sound rises and falls in an unintelligible babel.